Stems: Erect, hollow, weak, glabrous, succulent, pale green, branched above, nodes enlarged. Leaves: Alternate, simple, ovate or elliptic, .8 to 4.8 inches long, .6 to 2.2 inches wide, thin, pale green, glabrous, pale or waxy beneath; margins scalloped or bluntly toothed; teeth widely spaced, often terminating in minute, sharp points; stalks 1/5 to 4 inches long. Inflorescences: Solitary or small clusters of 2-4 flowers from leaf axils, drooping; stalks to 4/5 inch long. Flowers: Showy, irregular, cornucopia-shaped, .8 to 1.2 inches long, orange to red, usually with crimson spots; sepals 3, petal-like, 2 lateral ones small, middle 1 spurred; spur 1/4 to 2/5 inch long, bent back parallel to body; petals appearing as 3, upper broader than long, lateral ones 2-lobed; stamens 5, anthers united around stigma; pistil 1. Fruits: Capsule, slender, somewhat club-shaped, about 4/5 inch long, glabrous, 5-celled; tip pointed; splitting into 5 spirally coiled parts; seeds 1/6 to 1/5 inch long, oblong to ovate, slightly flattened, surface often bumpy, 4 longitudinal ridges, mottled green to dark brown; tip beak-like. Habitat: Moist woods, stream banks, wet roadside ditches, wooded marsh and pond margins, seepy areas, moist disturbed areas. Distribution: East 1/4 of Kansas and Cloud and Norton Counties. Toxicity: Toxic to livestock when consumed in large quantities. Forage Value: The seeds are eaten by prairie chickens, pheasant, quail, ruffled grouse, and white-footed mice. Uses: Native Americans applied the crushed leaves and stems to skin rashes and eczema. The juice of the plant has been shown to have fungicidal properties. The juice alleviates the itch of poison ivy and the pain of stinging nettle and was rubbed on the head for headaches. A poultice of the crushed flower buds was applied to cuts, burns, and bruises. A cold infusion of the plant was taken for fevers and stomach cramps and used as a liniment for soreness. The whole plant was used to make an orange-yellow dye. The young shoots are edible, after boiling and changing the water. Comments: Impatiens is derived from the Latin word for "impatient". The common name touch-me-not alludes to the behavior of the capsules, which spring apart when touched, propelling the seeds outward. 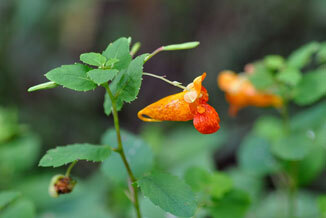 The common name jewelweed refers to the dew droplets that are often observed on the plant, causing it to glisten. The curved spur holds the nectar. Ruby-throated hummingbirds and bumble bees pollinate the flowers.